How is behavior output organized in a brain based on external sensory inputs, internal motivational states or even knowledge gained through prior experience? Understanding these processes is the most essential issue in the field of neuroscience. For centuries, researchers in the functional brain sciences have been mapping properties of behavior to areas of the brain. Yet, the step from simple maps to a generally accepted model has proven exceedingly difficult. Among the extremely reduced model organisms (e.g. C.elegans or Aplysia) that only on a constricted level allow for meaningful comparisons with humans, and more complex vertebrate systems (e.g. mouse, zebra fish) that have numerical, ethical and technical constraints, the classical genetic model organism Drosophila has acquired an important intermediate position. 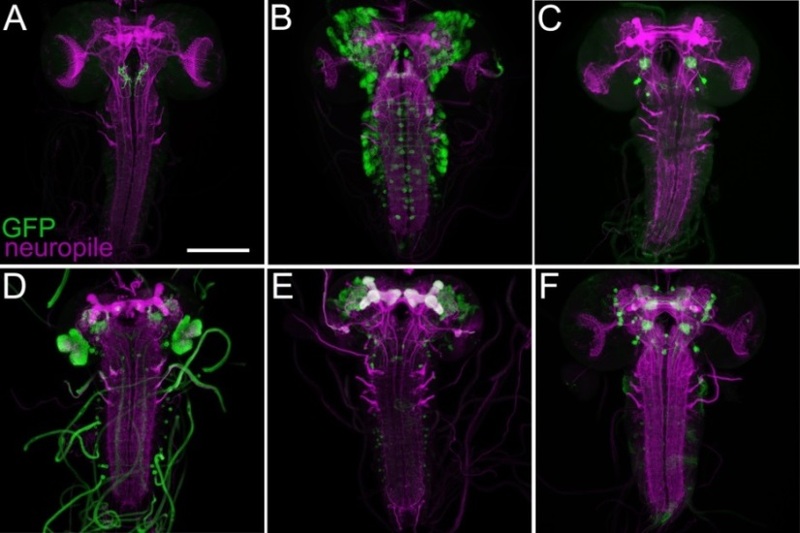 Recent approaches either try to establish the complete connectome of the larval brain by serial transmission electron microscopy (TEM) or work on a 3D brain atlas for its adult counterpart based on confocal microscopy stacks of different GAL4 driver lines. However, both approaches have reached biological limits; whereas the TEM method is restricted to the anatomical level of a single brain but allows for the establishment of the connectome based on its high resolution, the 3D registration allows linking anatomical data to functional studies. However, so far it is restricted to about 10% of the adult Drosophila brain due to its numerical complexity of about 200.000 neurons. Therefore, we propose a joined approach to establish a comprehensive 4D reconstruction of the about 10.000 neurons of the larval brain based on GAL4, LexA and split-GAL4 lines. The project will be realized by the unique expertise of three groups working in the field of neuroscience and informatics; 1) The Thum lab will visualize these neurons by immunohistochemical techniques and confocal microscopy. 2) The Merhof lab will register these neurons based on its anatomical information onto a standard brain. 3) The Bühler lab will process, organize and visualize the processed data in an open access database. 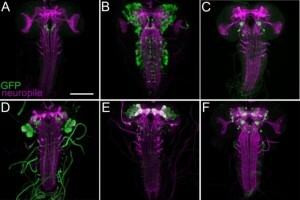 In addition, the labs of B. Dickson and J. Truman, both located at the HHMI Janelia Farm Research Campus (USA) will support the endeavor by offering access to the worldwide largest set of genetic tools and anatomical raw data on larval brain anatomy. In summary, our approach will reconstruct the larval brain in 4D on the neuronal level; at the same time it will also define a new set of annotated (in an open access database) and freely accessible neurogenetic tools to investigate the particular function of single neurons within an entire brain. By that – for the first time – it will be possible to establish a common resource base that offers support for the rapidly growing neurobiology community in Europe working on the Drosophila larva.